An elegant glass entry door can make a welcoming statement, as the focal point on a well designed entrance to your Apex NC custom home. Here are six popular entry door designs – with some tips on how to choose a glass design with the configuration, shape and size that will look exactly right on your new front door. This Apex new home front door style contains classic features such as a full-length glass design, two side transoms, and an upper transom. This glass door is specially designed to provide a classic blend of natural light and privacy. 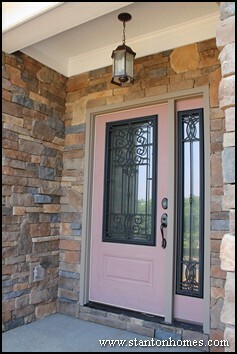 The custom home designer extended the palate of color in the glass door's leaf design by coordinating it with shades of purple and grey in nearby craftsman style stone columns. 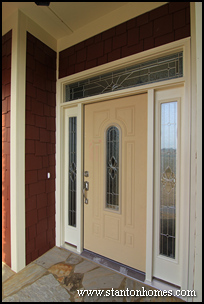 See a similar full-length glass door design in a version of the Cove - click here. For an even more dramatic statement, consider adding second sidelights for a wider foyer entrance. This glass front door - pictured from a version of the Country Manor - takes advantage of the view, while adding artistry to the home's custom-drawn symetrical design. 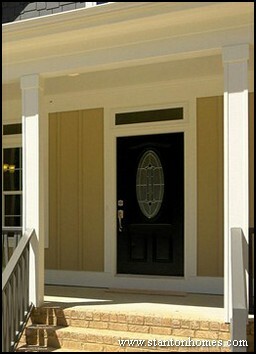 This entry door style includes full length side transoms, an upper transom, and a 3/4 center transom with arched top. 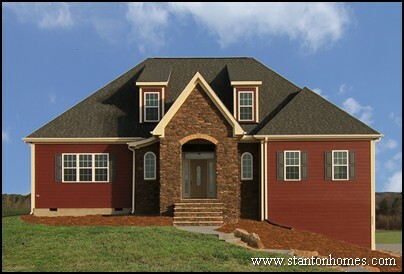 The center arched piece was chosen to mirror arched stone porch and arched windows on each side. 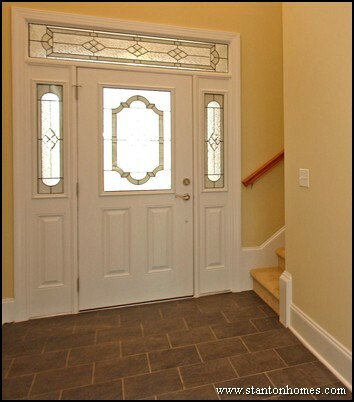 The Apex NC custom home front door pictured to the right has a huge impact on the entry way, with two sidelights and an upper rectangular transom. The squared-off door frame intentionally contrasts against the two story barrel vault in this custom home foyer. The 1/2-view door incorporates several glass design and cutting techniques. 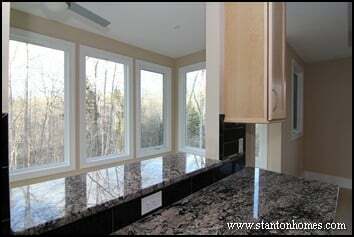 - Glue chip glass composes the bulk of the window area. 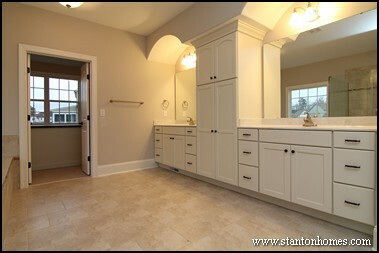 - Each of the darker border areas pictured in this door are composed of an Alabaster glass style, to add character. Glass front doors can be economical and provide an air of practicality, when they contain just a touch of decorative glass. 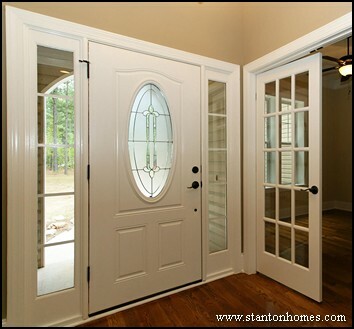 The custom home front door pictured to the left features a specialty 3/4 oval view and two sidelightes with the simplicity of standard glass. The impact of this front glass door becomes more dramatic when installed adjacent to first floor office French doors, as pictured here. The secondary doors were chosen to reflect the classic glass design in the front door sidelights, and extend a feeling of openness. A contemporary custom home can also benefit from a glass front door, like the example here. Look at the way the front door influences the design of the entire home, through replication of its straight lines and light colors in the picture window above, the built-in bookcase in the adjoining room, the balusters in the overlook, and the chair rail and wainscoting beyond. Dramatic! 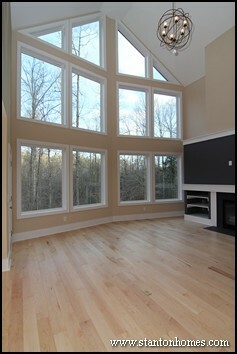 See more photos of this home - a version of the Carwile. - If you go with glass, make sure the bevel and design coordinate with the patterns of your surrounding walls, fabrics and furniture. 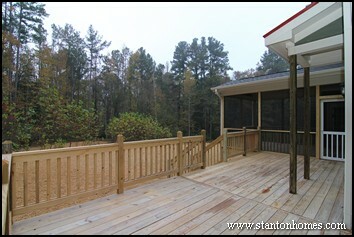 - You can match your exterior and interior design through a dual color scheme. 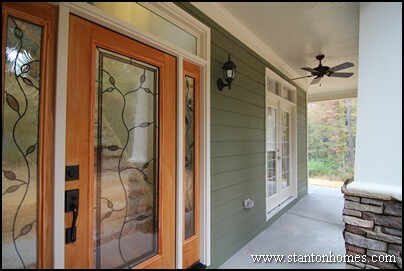 Stain or paint the exterior side of a door a different color than the interior side. A brighter, bolder statement can be made on the outside, while maintaining cool tones in the foyer. - How many windows are near the door? You’ll want the shapes and styles to blend. - What materials does the door come in? Some products cannot be stained. - Do glass doors hamper privacy? Textured glass doors come in a "glass privacy range" - with more or less opacity. 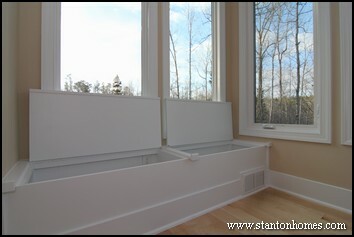 Verify that the door you choose has the the right amount of opacity for your level of comfort. 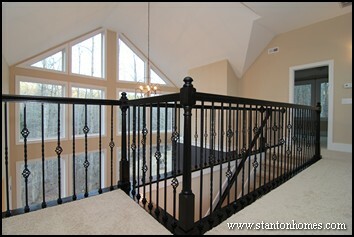 At Stanton Homes, we make home design – including all your entrance options - EASY. 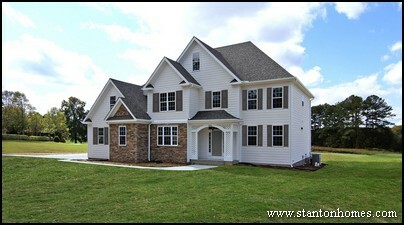 We'll work with you to create the style you’re looking for – as part of your Apex NC area new home package. What matters most to new home buyers in the Raleigh, NC area? According to a survey of more than 20,000 home buyers completed by John Burns Real Estate Consulting, design matters more than price when purchasing a home. 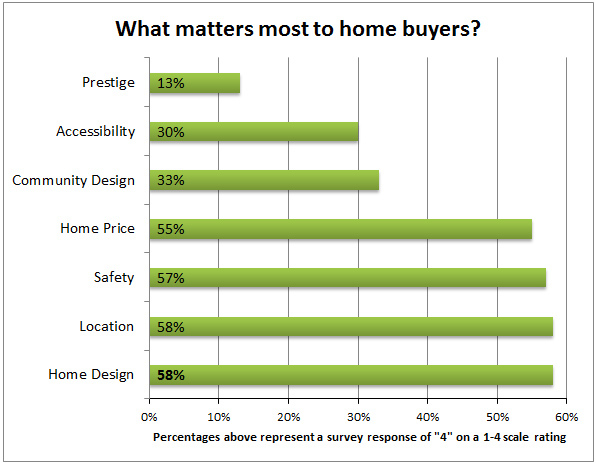 2012 is the second consecutive year that home shoppers rated design above price. 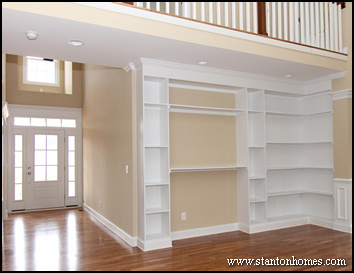 Today's homebuyers are more intuitive about look and feel, long-term value and personal space and are turning to custom builders like Stanton Homes to work with them to create an environment with everything just the way they want it. 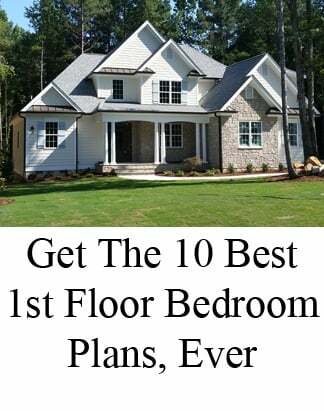 In fact, the overall appeal of a new home is so important to today’s buyers that respondents even ranked home design above safety and community design, followed by accessibility and prestige. What’s so special about today’s new home designs? 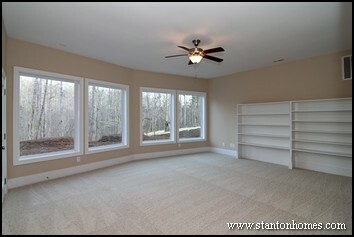 With custom design builders like Stanton Homes, it means creating living space around lifestyles, with special function rooms like huge mudrooms, family centers, and customized island kitchens, and better living flow than can be found in box homes built by the block, or older homes with closed in spaces. 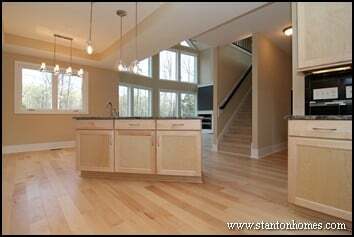 Buyers who decide to build a home increasingly look for a design team that can wrap ideas into a floor plan that’s perfect for the way they live – beautiful, functional and energy saving. 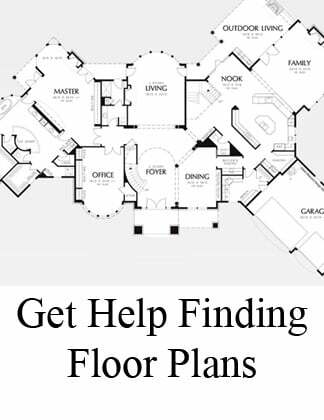 New home tip: When looking at your own new home design, don’t just pick a pretty plan. 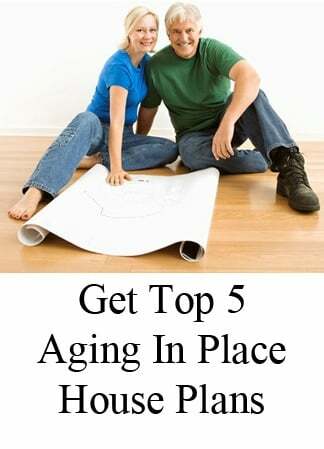 Talk to the builder, and find out how much he really knows about the kind of home you have in mind. 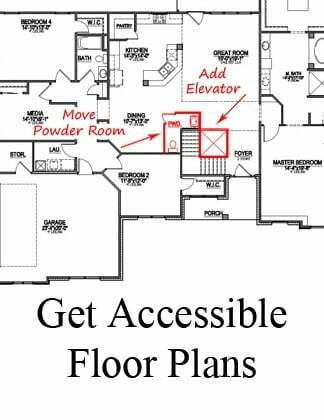 A knowledgeable builder can create your vision with a design that’s all your own – at a lower price than you might imagine. Read more about the John Burns survey here.